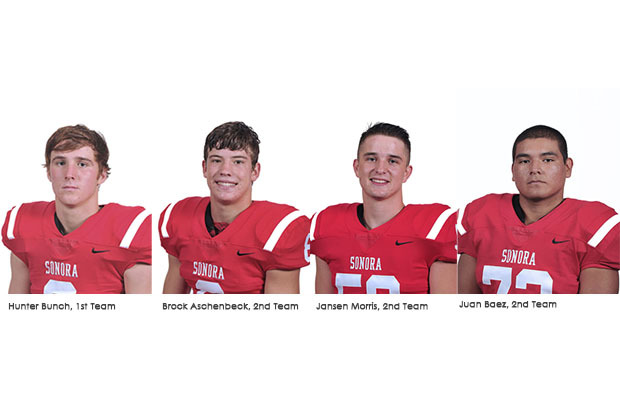 Almost two months after the end of the 2018 football season, All State honors continue to trickle in for the Sonora Broncos. Four Broncos football players were selected to the 2018 Padilla Poll Coaches All-State 3A-Division II team released on Tuesday, January 29,2018. Senior Hunter Bunch, Defensive Back, was named as a First Team selection on Defense. Second team selections went to Senior Juan Baez, Offensive Lineman, Junior Brock Aschenbeck, Linebacker and Junior Jansen Morris, Defensive Lineman. Aschenbeck and Morris will be returning to the Broncos in the fall for one more season with the Broncos. Head Coach Jeff Cordell said as always he is proud of his players and he applauds their success both on and off of the field. “Congratulations on an amazing accomplishment,” Cordell said.